Do you want to engage your students during your Leveled Literacy Intervention (LLI) Blue Kit instruction? This SMART Notebook file includes both the Phonics/Word Work and Optional Letter/Word Work sections of LLI Second Edition lessons 91-100. 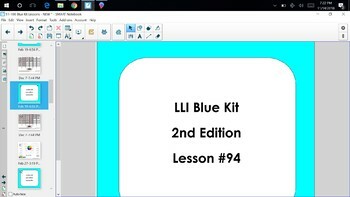 The lessons have been completely revamped from the LLI First Edition lessons. Please only download the file if you have the SECOND Edition Lesson Guide. Students take turns coming to the board to complete the activities. For some of the activities, a student touches a box to uncover a word, then uses phonics skills to read it. I usually have my students write the words in their journals. 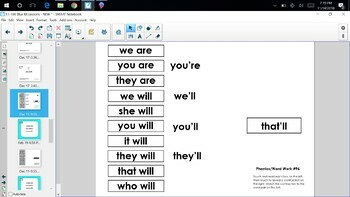 For the lessons that use the LLI materials, such as the Alphabet Linking Chart or Consonant Cluster Chart, you will need to add those to the file, as they are the property of the program publisher. 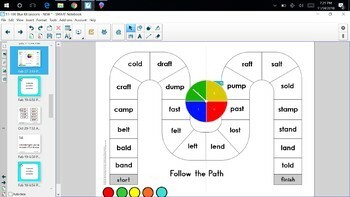 Your students may also play "Follow the Path" right on the Smartboard!